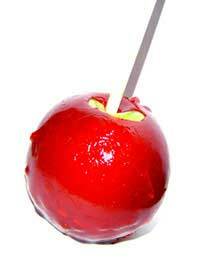 Toffee apples are a true winter treat. Traditionally eaten in Britain on Bonfire Night, there is nothing quite like biting through the hard toffee into the soft apple below.Despite being a Guy Fawkes tradition, children love toffee apples at any time of year and they can be made in batches, wrapped in film and will keep for weeks on end before they need to be eaten. Toffee apples are, of course, usually made with sugar - toffee is, in fact, little more than sugar and water - but it is perfectly possible to make alternative versions.They can also be dressed up a little and made more exciting, with the addition of one or two extra ingredients. This is a straight forward recipe for sugar free toffee apples. It can be great fun for children to make with adults but do remember the hot liquid will burn terribly if spilled on the skin. Place your granulated sweetener, water and vinegar in a medium saucepan and stir over a low heat until dissolved. Bring to the bring and leave to bubble. Every so often take a small amount on the end of a tsp and drop into a glass of cold water. When the toffee sets hard it is ready to use. Wash your apples and remove the stalks. Going from top to bottom, press a stick through the centre of each apple, to create a giant lollipop. With the stick in your hand, dip each apple into the toffee, making sure the whole fruit is completely covered. Stand the toffee apples on a lightly greased baking sheet (apples down) and leave to cool on the side. When cool, place in the fridge over night. The toffee apples are now ready to eat or to wrap in cling film, tie with a ribbon and store or present as a gift. These toffee apples have extra bite with the addition of nuts. You could also allow them to set, then dip them again in melted sugar free chocolate, to create a delicious chocolate nut toffee apple. Place your peanut butter, granulated sweetener and vinegar in a medium saucepan and stir over a low heat until dissolved (the only lumps should be the chopped nuts in your peanut butter). Bring to the bring and leave to bubble slowly. Every so often take a small amount on the end of a tsp and drop into a glass of cold water. When the mixture sets hard, it is ready to use. Wash your apples and remove the stalks. Going from top to bottom, press a stick through the centre of each apple, to create a giant lollipop. With the stick in your hand, dip each apple into the mixture, making sure the whole fruit is completely covered. Stand the nutty apples on a lightly greased baking sheet (apples down) and leave to cool on the side. When cool, place in the fridge over night. The sugar free nutty apples are now ready to eat.